When people think about the roots of Zionism, Theodor Herzl and the publication of Der Judenstaat (“The Jewish State”) in 1896 may come to mind. But while Herzl was one of the most important figures in the Zionist movement, he was far from the first to call for a Jewish homeland. “The German Roots of Zionism” is one of the current exhibitions curated by the Leo Baeck Institute, a New York-based research library devoted to German-Jewish history. 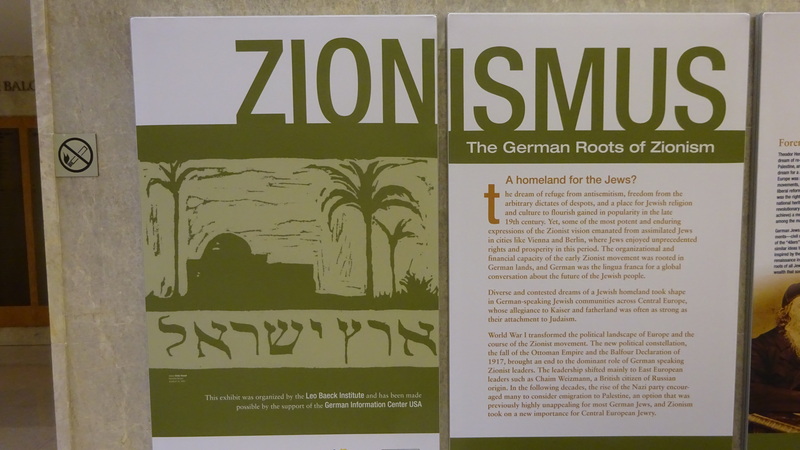 The exhibition, produced in cooperation with the German Information Center, explores the development of Zionism and the influential role played by German-speaking Jews. The German roots of Zionism go back to the 19th century, when Europe was shaken by revolutions, including the 1848 March Revolution in Germany. Revolutionary groups in pursuit of a united German country and democracy failed, but the idea of democracy and a united state stayed in the minds of the people. Many Jewish citizens were part of the revolution in Germany and soon came up with the idea of their own state—a Jewish state. Herzl wouldn’t be born for another 12 years. Among the forerunners of the Zionist movement were Moses Hess and Zvi Hirsch Kalischer. In 1836, Kalischer, a German Orthodox rabbi, convinced a French banker to buy land in Palestine for Jewish immigration. Until his death in 1874, he promoted the idea of a Jewish state—using other national independence movements in European countries as models—by traveling to large Jewish communities around Europe and publishing articles in Hebrew newspapers. His ideas encountered resistance from the majority of Orthodox rabbis, but also inspired some Jews who were supportive of the Zionist idea, a minority at the time. Moses Hess, a German-Jewish philosopher, dealt with the topics of socialism and Zionism in his work and is considered the father of “Social Zionism.” He believed Judaism to be not just a religion, but a nationality. In 1862, he published “Rome and Jerusalem,” writing, “The rise of Judea begins with the reincarnation of Italy,” a reference to the revolution in Italy in 1848. The Leo Baeck Institute exhibit reminds us of the lesser-known names of the Zionist movement, displaying the history of Zionism from 1862 to 1941 on 15 panels. The framed panels—along with illustrations, texts and timelines—show the development of Zionism. The exhibition first opened at the Washington Hebrew Congregation in fall 2015. The 50th anniversary of diplomatic relations between Israel and Germany last year was the impetus for the exhibit. The response has been overwhelming, and the GIC now plans to expand the reach of the exhibition by taking it to more cities. A message to Renata Stern and Carol Kahn Strauss; If you want to expand this exhibit to other cities, please contact Dr. C.D. Weaver, Austin Presbyterian Theological Seminary, Austin, Texas.